Americans eat more chicken than any other country in world most of which comes from the United States. The country has over 30,000 family owned poultry farms and over 70,000 broiler houses1. 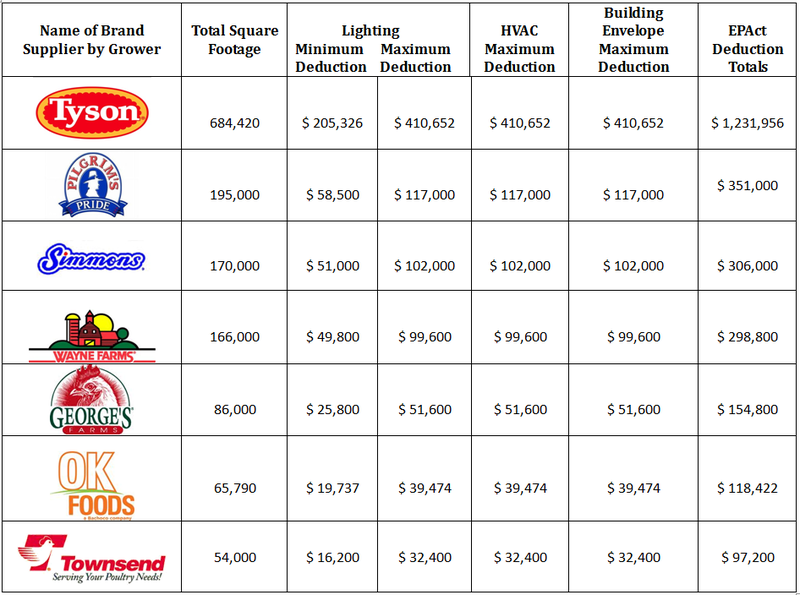 In addition to complying with food processing companies’ standards, chicken growing facilities must consider yields per square foot and energy consumption. These energy intensive facilities can profit from moving away from incandescent technology and installing LED lighting in its place. This transition means energy cost savings and a large EPAct tax incentive opportunity as well. Pursuant to Energy Policy Act (EPAct) Section 179D, buildings making qualifying energy-reducing investments in their new or existing locations can obtain immediate tax deductions of up to $1.80 per square foot2. Exhibit 1 presents potential EPAct tax savings available for the chicken (broiler) growing industry. One of the greatest considerations when changing technologies within the broiler growing industry is whether the growing cycle will be affected. This question was posed and answered by a University of Arkansas field study which pitted several lighting technologies against each other both in terms of energy efficiency and broiler production1. The study was controlled so that some of the houses kept their incandescent bulbs and some of the houses utilized newer fluorescent and new LED lighting technology. The study enlisted the support of both the growers and an anonymous chicken processing company; both were characterized as eager participants. The study concluded that long life, low wattage LED lighting is a viable alternative for chicken growing facilities. This technology has proven to support optimum yield performance of the birds and was harmless to the growing cycle. In addition, the study facilities realized major energy cost savings from the LED lighting. LED lighting lasts forty times longer than traditional technologies and uses one-tenth the electricity that today's incandescent light bulbs use. Along with energy costs reduction, LED lighting presents a significant tax savings opportunity. LED projects usually qualify for considerable EPAct tax deductions most times at the $1.20 to 1.80 per square foot level5. Conserving energy and protecting the environment is a good policy on its own and one that attracts environmentally conscious customers. A growing number of prominent companies are implementing supplier sustainability programs, which are raising sustainability standards throughout the entire food supply chain. Food processing suppliers selling to Wal-Mart7, a large chicken purchaser, for instance, must respond to 15 sustainability questions, concerning energy and climate, materials efficiency, nature and resources, and people and community. Target, another large chicken purchaser, also has its own sustainability program8. These first tier suppliers are encouraging similar sustainability for lower tier suppliers, which also must be ready to implement energy costs. Energy efficiency measures, such as lighting and HVAC upgrades, represent major steps towards a better environmental performance. EPAct tax deductions are available to assist companies in this endeavor. To both decrease operating costs and increase their supplier positions under consumer sustainability programs, both growers and chicken processors can benefit from LED lighting upgrades. Growers can increase profits by lowering energy costs and processors can boost their supplier status with Wal-Mart, Target, and other major chicken purchasers. Chicken farmers who are able to change to more efficient LED technology will enjoy energy savings and a high likelihood of receiving a $1.80 per sq. ft. tax deduction. 2 - Energy Policy Act of 2005 (P.L. 109-58). 4 - National Chicken Council. http://www.nationalchickencouncil.org/. 5 - Corporate Business Taxation Monthly. Optimizing the 3, 2, 1 LED Lighting Tax Deduction Countdown. Charles Goulding, Kenneth Wood, and Raymond Kumar, July 2010. 6 - University of Arkansas System's Division of Agriculture. Field Demonstration of Advanced Lighting Technologies for Poultry Houses., Dr. Susan Watkins, Susan Sullivan, and Dr. H.L. Goodwin. 2011. 7 - Corporate Business Taxation Monthly. The EPAct and Alternative Energy Tax Aspects of Wal-Mart's Supplier Sustainability Program. Charles Goulding, Jacob Goldman, and Christopher Winslow, June 2011. 8 - Corporate Business Taxation Monthly. The Tax Aspects of Target's Corporate Responsibility Program. Charles R. Goulding, Andressa Bonafe, and Raymond Kumar, to be published in 2013.